Exploring Miami during Art Week is a visual extravaganza. Art, people, architecture…there is also unbridled energy. Architecture. Zaha Hadid, Rem Koolhaas, Herzog and de Meuron, and Bjarke Ingel buildings are going up. Residential high rises with commercial space. As we understand it, many buyers are South American and the developers are requiring 50% deposits on spec buildings. They are hoping to avoid the financial bubble of the recent past. The Wynwood area of Miami is the new design design district. As the rents in Miami Beach soared, designers, artists and the hip are moving on to Wynwood. People. As mentioned above, South Americans feel at home in Miami. Europeans love the energy, the exotic collage and the weather. Of course, Leo DeCaprio, Sean Combs and other celebrities were on hand for the art. Art. Of course, this was the reason to be in Miami this week. The shows fell into various statuses. A collection of galleries showing the art that most museums would love to exhibit. 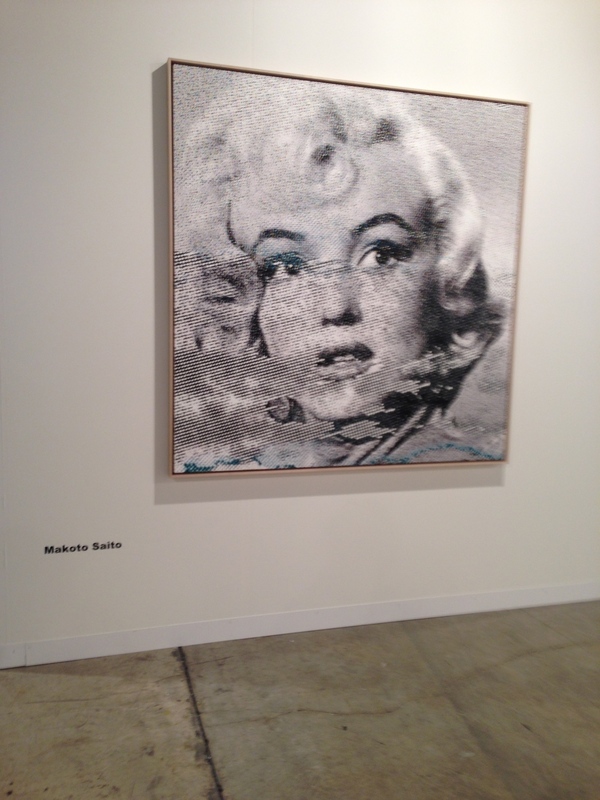 Picasso, Miro, Weiwei, Koons…And collectors were buying; little red dots and x’s everywhere. In addition to the collectors and gawkers, there were many school groups-mostly high school. What an incredible experience for them. Across the street from Art Basel but a million miles away in terms of interest and excitement. The entrance-a pitched roof seemingly held up by a giant sand dune- was a fascination of engineering by Formlessfinder. For the first time, Jeanne Prouve’s 1944 house was exhibited publicly. Other than these two exhibits, we found the show rather banal. Graffiti influence: Not just graffiti artist like Banksy but an influence on more traditional artist. Repurposing: Several artist took icon art and added their own touch. Photography: There was more photography. Also a fascination with the Kennedy years. Appropriate for the 50th anniversary. Below a triptych and accompanying letter at the Sagamore show. We need more Bechtler’s and deMenil’s.